Twice this week I woke up from such a deep sleep that I didn’t even know what day it was (although I hoped it was Saturday), where I was, and whether I was supposed to go catch a bus or not. I actually put the date “le vendredi 14 janvier 2014” on my PowerPoint for the lesson I was teaching my classes today and didn’t realize my mistake until I was teaching my second class. The word “janvier” means “January” in French, not February. Oh, dear! On top of that, not really thinking, I decided to add in another activity to my lesson to try to fill in some extra time which made me look like a bit of a V-day “Grinch,” if they exist. I suppose, they do since I definitely must have come across as one. Anyway, I made them watch this video and write down the adjectives that they heard and then tell me if they liked the video or not. Yeah, they all either laughed or just looked at me and told me that they surely did NOT like this video. Well, at least, they uh, practiced hearing someone introduce themselves in French, right? Thus, it’s obvious that well, my February 14th was just February 14th in my book, if I even wrote the date down correctly. I’m okay with it being that way though. I’m too tired and busy to really think of it as anything else. So, what have I been doing tonight….other than laundry??? Can’t let an excuse to curl up under a blanket in front of a movie slip by, right? Well, first of all, I’m cold. We randomly have snow falling outside….again! Because of the road conditions, I suppose, my normal bus didn’t come which turned into my trying another bus route. This resulted in my having to walk through 3 foot snow drifts and slip and slide across slushy roads to get home which made me feel like I’d turned into a Popsicle– yeah, it was that kind of Indiana wintery afternoon. Thus, upon walking in the door of the apartment, the first thing on my mind was “Do I have the ingredients to make chicken noodle soup?” as I tried to get feeling back in my extremities. Soup is just perfect for these kind of days.Thankfully, the needed ingredients were found, and I was happy soup making in a matter of minutes. Secondly, I got a couple of things done that needed to be done and am working on a small project that’s not school related. I’ve enjoyed a quiet evening. I’ve been enjoying laughing with my little brother through Facebook and keeping up with some friends. I have yet to touch the papers I need to grade, but I needed a night off. I suppose, my point is that it’s okay to have a normal, crazy February 14th, and not have it be a reminder of what one doesn’t have. Besides it being wrong to be discontent, it’s rather exhausting too because all one does is worry and grumble as a result. At least, that’s been my experience. It’s been a tough winter, and it’s easy for me to think it will last forever. It’s easy to think that way about life and disappointments as well. However, guess who I saw today as I was standing in the cold waiting on a bus? 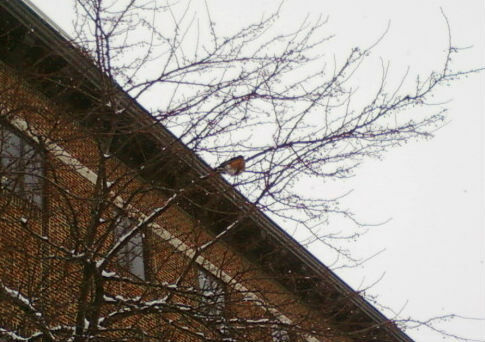 Yes, Mr. Robin was up there fluffing his feathers trying to stay warm amidst all of this falling snow! It was a nice reminder for me in a moment when I had just about had it with winter, being cold, feeling disappointed, and just missing home that, yes, spring is coming. The winter and the snow will not last forever! So, here’s to trying to be thankful for what I have and yes, trying to be content even when the winter both in life and in season seems to drag on forever! God has a plan and nothing can separate us from His love, nope, not even winter nor anything else that we’ll face in life. Now, that, my friend, is true love right there. This entry was posted in Daily Life and tagged life, Robin, Valentine's Day, winter. Bookmark the permalink.